My father was career military so I'm not really “from” any one particular place, but between childhood, adolescence and adulthood, I've spent more than half my life living in former Confederate states, so technically, I qualify as a “Southerner.” And I'm about as pale as you can get without crossing the line into full-fledged albino status, which means I'm among the whitest of white Southerners, too. Meanwhile, there's an ongoing argument which claims that my own heritage, history and/or culture is under attack, due to efforts to remove Confederate memorials from public places, or rename public streets and buildings named after Confederate heroes. To which I say: hogwash. Quit honoring Confederates; the only good thing to say about the Confederacy is that it lost. If private citizens want to continue honoring the memory of slavery and those who fought to defend it, that of course is their right, but the government should not be using taxpayers' money to glamorize such people. Nor am I impressed by arguments that statues or road signs honoring Confederates are a vital part of “Southern heritage,” “Southern history” or “Southern culture.” Surely, there's more to the heritage, history and culture than those four years fighting for the right to own slaves? You could name streets after various Southern literary greats -- there's far too many to mention here, but off the top of my head I can think of Harper Lee, Kate Chopin, William Faulkner, Truman Capote and Alice Walker. Or, erect monuments and name public buildings after the various genres of music which started in the South, or the Southern musicians who made those genres famous. One could honor famous painters and other artists from the South. Or Southern inventors and scientists ranging from John Pemberton to George Washington Carver …. if “honoring Southern history, heritage and culture” (rather than honoring white supremacy and those who fought to maintain it) were the actual goal, there are plenty of options which don't require fetishizing the four years white Southerners spent trying to secede from the United States so they wouldn't have to give up their slaves. For the past couple weeks I've been facepalming on the sidelines of two online free-speech battles: a small skirmish generally unknown to anyone outside of the libertarian Twittersphere, and a larger, more recent war making headlines around the world. First, the libertarian skirmish: during a libertarian conference on the weekend of July 29, the Ladies of Liberty Alliance, using the hashtag #MakeLibertyWin, went on Twitter to ask for suggestions on how to get more women involved in the libertarian movement. 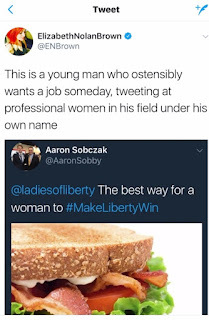 In response, a young man named Aaron Sobczak, a Liberty University student who is or was the state chair of Virginia's Libertarian Youth Caucus, tweeted back a photo of a sandwich, alongside the witty and original suggestion that this is “The best way for a woman to #MakeLibertyWin.” Later – though I don't know the exact timeline of events – he doubled down on his comment by making a public Facebook post claiming that “screeching feminists” are why women shouldn't be involved in the liberty movement at all (except, presumably, as sandwich-makers for the menfolks). Which made a lot of capital-L Libertarians furious – what kind of horrid groupthink is Brown promoting, suggesting that a man should suffer professional consequences just for spouting an unpopular opinion? Libertarian hypocrisy: "We don't need anti-discrimination laws; The Market will punish sexism. Also, how DARE ENBrown call out this bigot!" I'll be the first to agree: it would be awful to live in a world where merely “expressing an unpopular opinion” seriously hurts someone's chances of making a decent living. But what if that “unpopular opinion” specifically boils down to “I believe certain groups of people – many of whom are employees or customers of my employer – are inherently inferior, somehow”? If a libertarian-outreach organization refuses to hire Sobczak just because he wants to pre-emptively write off slightly more than half the human race, is that organization punishing him for non-conformity to groupthink – or making a sensible, defensible decision? I stand by @ENbrown and those who critiqued the "sandwich tweet." Here's why... The tweet was posted in response to a discussion about women's role in the liberty movement and misogyny faced by libertarian women. The tweeter is a low-level representative of a liberty org who was attending a liberty conference and tweeting at fellow libertarians. No one searched out sexist jokes to make an example of their tweeters; the tweet was meant to be seen. It was made publicly, using the hashtag of the discussion, & tagged numerous libertarian women & orgs. It was not taken out of context. This was not a "joke." When called on it, the tweeter's response underscored these were his actual views on libertarian women. He (posting publicly on Facebook) said "screeching feminists" are exactly why women shouldn't be a part of the liberty movement. Suggesting that someone who hold these views is not a good ambassador for liberty is not an attack on his free speech. None of the people critiquing the original tweet called for legal repercussions or a violent response to silence the tweeter. However, some libertarian women who shared the tweet received anonymous texts with their home addresses & threats (actual doxxing). While I do think political correctness and call-out culture has in many cases gone overboard, this was not such a case. Libertarians must take a (peaceful, voluntary) stand against bigotry espoused by those who purport to be a part of our movement. Misogyny is not a libertarian value and standing against it is not an attack on free speech. I've no qualms about admitting I agree completely with Murti's take: a man who espouses views antithetical to liberty shouldn't be employed in the liberty movement. But what about non-political (or apolitical) employers – is it acceptable for them to not-want to hire a man who publicly argues the inherent inferiority of women? Who is the source of the problem here: the man who repeatedly, publicly expresses a low opinion of women, or the women (and friends of same) who don't want to work with or for such a man? A few years ago, the then-CEO of Mozilla resigned after it came out that he'd donated time and money to political efforts against gay marriage. Same conundrum: yeah, it stinks that someone lost his job merely for an unpopular opinion, but on the other hand that specific opinion was "Certain of my fellow citizens – many of whom work for this company, or use this company's products – are undeserving of full equal legal rights." Are the "un-equal" people in question being oppressors, if they say "Y'know, I really don't want to work for or with a man who is so convinced of my inherent inferiority?" Or "Given how many identical products there are on the market, I choose to use the product made by executives who don't seek to deprive me of equal rights?" If nothing else, I admire Damore's talent for creating semi-plausible deniability for himself: no, he did not specifically say that striving for full racial or sexual equality is as unrealistic as Communism's attempts to bring about full economic equality. And he doesn't specifically say that anyone opposed to sexism or racism is either a gorram Commie or unwilling dupe of same. All he did was post a historical fact about the repeated failures of Communism! And all Sobczak did was tweet a photo of a delicious-looking sandwich.